Two Kings principal Christopher Wang presented at a seminar on Opportunity Zones, sharing insights about evaluating potential investments and maximizing the tax benefits from the new tax-shelter program. Two Kings co-hosted the seminar with accounting firm Marks Paneth and title company Cornerstone Land Abstract. Opportunity Zones allow investors to defer and reduce taxes on capital gains while investing those proceeds tax-free in eligible Opportunity Zone projects. Two Kings is currently developing a project in one of only six Opportunity Zones in lower Manhattan and is evaluating other eligible investments in the New York City region. For more information, please contact us at info@twokingsrealestate.com. Two Kings principals Manish Shah and Christopher Wang shared insights about real estate investing with a group of MBA students at Fordham University. The principals were invited by Adjunct Professor Eric Yeh, who teaches coursework on Alternative Investments at Fordham. Two Kings is committed to promoting economic education. For more info, please contact us at info@twokingsrealestate.com. Two Kings principal Manish Shah is moderating a panel discussion at IMN’s 19th annual U.S. Real Estate Opportunity & Private Funds Investing Forum in Newport, RI. The panel, “Opportunistic Vs. Value-Add Vs. Core Vs. Debt,” discusses real estate asset choices amid a backdrop of a growing economy and rising interest rates. For more information, please contact info@twokingsrealestate.com. 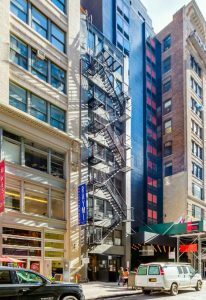 Two Kings closed on its acquisition of 41 West 24th Street, an 8-story elevator building less than a block from the popular Madison Square Park commercial district. The upper floors of mixed-use building have large residential units with high-end finishes. The retail space is occupied by Chop Shop II, an Asian-style eatery operated by an established NYC restaurant team. Two Kings targeted the property for its significant future upside given its location in the Flatiron District, an area that is experiencing growing demand for office and residential space in addition to having an increasingly popular retail and dining market. Two Kings presented on investing in real estate and private equity at NYU’s Kimmel Center. The panel was hosted by Global China Connection’s NYU chapter. Two Kings shared information about recent investment projects and offered perspective on developing careers in the real estate and private equity industries.